Summer’s almost here, and that means sunshine, singing birds, and lots of time outdoors. It can be hard to find a more comfortable place to take in all that summer beauty than your own backyard. That is if you have a backyard that you actually enjoy spending time in. Creating a beautiful, relaxing outdoor space is something that we seldom think about until it is time to throw a party, take a dip in the pool, or host your annual summer barbecue. Before you tackle any of your outdoor summertime traditions, take a few minutes to consider just how well your outdoor space works for you and your family and how you can improve it. 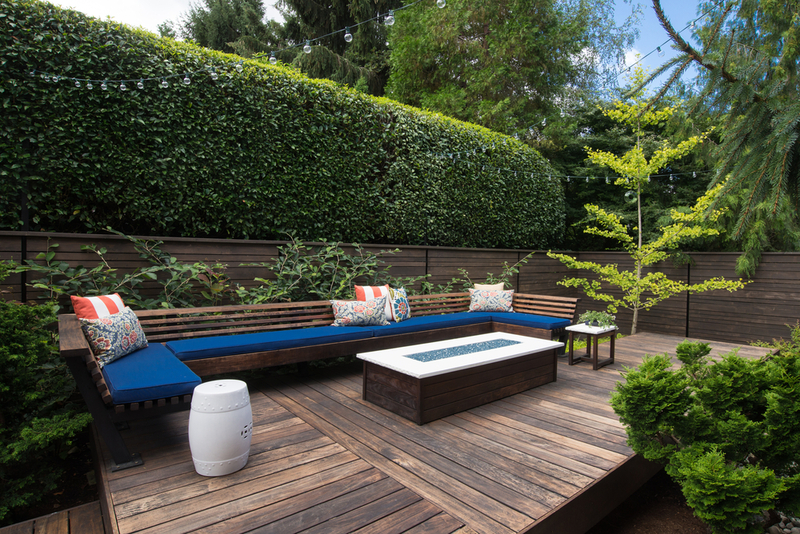 Your backyard says a lot about your style, your comfort level, and your entertaining habits, but even those who keep up with design trends seldom think about updating their outdoor spaces to meet their evolving needs. This summer, instead of using the same old outdoor space (or worse, skipping using it altogether), transform it into the best spot in the house with these fabulous backyard additions and revamping tips. Outdoor spaces should beckon you to take a load off and relax at the end of a long work week, but if your backyard furniture is worse for wear, exclusively metal, or simply not relaxing, it is time to invest in some alfresco comfort. Cushy sectional sofas, padded loungers, oversized Adirondack chairs, and of course, a big ole comfy hammock are all excellent ways to add some much-needed comfort to your backyard. But it’s just the start! Cushions should be soft but firm, and there should be plenty of cozy throw pillows to keep your lower back comfortable. Don’t forget the finishing touch of optimum comfort – a blanket to snuggle under so you can watch the night sky with your family. Nothing makes us feel more vibrant, energized, and excited than a pop of bright, happy colors, and that’s just what your outdoor space is begging for. Instead of coating everything in jungle greens or bright whites, opt to add splashes of color throughout your yard that draws the eye to the beauty all around you. Throw pillows, lanterns, candles, colorful flower pots, painted wooden chairs – all of these are great ways to give your backyard some color without detracting from the natural greenery. Of course, the best way to add some color to your backyard is to plant some flowers! Gorgeous lavender bushes, brightly-colored lilies, hearty wildflowers, and tried and true roses will add not only color to your yard, but they will attract bees too, so you’ll help keep the bee population buzzing! If you don’t spend enough time in your backyard because it doesn’t feel intimate, add some privacy. A new gate, a stone partition, a hedge, or even a three-walled trellis surrounding a seating area will create an intimate, quiet space in your backyard that will make you feel like you’ve got the whole block all to yourself. Instead of letting your backyard fall prey to “too much of a good thing,” break up the space with a variety of textures. Wood is a backyard favorite and can be added with chairs, side tables, pallet furniture, and wooden garden boxes. Flagstone walkways, brick pavers, smooth river stones, large boulders, and small gravel can add a lot of natural texture to your backyard. Many people enjoy adding stone to their backyards via benches, barbecues, and fireplaces. A touch of glass can also do a world of good to your backyard. From hurricane glass vases to stained glass decorations, glass will capture the sunshine and add a bounce of color too. No matter how warm it gets, everyone enjoys congregating around a glowing fire. Fire pits are a natural gathering point in backyards everywhere, so it should be no surprise that adding one to your backyard will make it more inviting and social. Fire pits come in a lot of forms, from large stone versions to bronze sculpture pits, and they can be as unique and individual as you are. You can even grab one at your local superstore and have a roaring fire up in no time. Water is the symbol of relaxation and tranquility, and if you’re looking to transform your outdoor space into a calming retreat from the stresses at home and at work, you can’t go wrong with adding a water feature. Depending on the size and utility of your space, adding a fountain, koi pond, or even a bird bath to your backyard can deliver the perfect level of peace and serenity to your outdoor space that you can look forward to at the end of a long day.